Bob Baker's Indie Music Promotion Blog: Blair Witch Music Project? Here's an interesting way to create a little mystery and buzz about a band. So, Colorless Green Ideas apparently took a cue from the successful indie buzz film Blair Witch Project and created a story about how Sofie had suddenly disappeared. The members started asking their fans for help in locating her. They registered the domain name FindSofie.com and posted mysterious clues little by little over a period of months, including a video and digital pictures of the missing singer. Check out the band's YouTube video clue, MySpace page and web site. I'm not sure how much buzz they actually created with this idea. But it seems like an excellent concept with a lot of viral marketing potential. Could you do something similar with an aspect of your musical story? 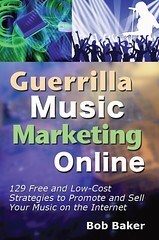 Wanna create a music buzz online? Check out my special report 50 Ways to Promote and Sell Your Music on the Internet. You'll see there is no Sofie Dhondt in the list. The idea is nice except that it will appeal mainly on their fanbase... Because it is totally unrelated to music, this parody didn't even make me listen to that band's music, and honestly I find it difficult to care about that little game. I dont think it's a good idea to promote unique ideas and tell people to do something "like" or "similiar" to something that has been done. The music business revolves too much around ripping off things that have "been done". This band sounds like that band etc.. This idea is a lot like that idea. I would like to see originality make a comeback. Not ideas spawned from something that already exists. Thanks for taking the time to comment. Your sentiment about originality is admirable, but the truth is, most human endeavors have been influenced by something another human did. If you were to name artists you feel are truly "original," I'm sure most of them would freely admit that they have been influenced by other artists. A musician who refuses to compare himself to other artists does a disservice to his fans and himself. Why make people guess what you sound like when you can give them a clue based on something they already know? And regarding marketing ideas, I agree with you. Too many bands promote themselves the same way they've seen a thousand other bands do it. That's why I like to point out ideas that are different. They inspire indie artists to think outside the lines and try something ... dare I say, "original." What Should I Write Next? You Decide!